Synthetic peptide conjugated to KLH derived from within residues 800 to the C-terminus of Mouse SOX6. IHC (PFA-fixed): on perfusion fixed wildtype P18 mouse dentate gyrus. Our Abpromise guarantee covers the use of ab30455 in the following tested applications. IHC-P 1/500 - 1/1000. Antigen retrieval is not essential but may optimise staining. Transcriptional activator. Binds specifically to the DNA sequence 5'-AACAAT-3'. Plays a key role in several developmental processes, including neurogenesis and skeleton formation. Expressed in a wide variety of tissues, most abundantly in skeletal muscle. 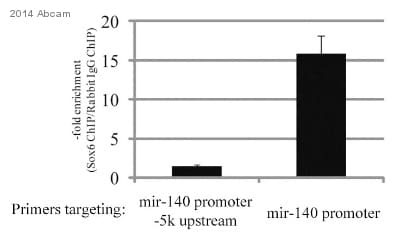 Sumoylation inhibits the transcriptional activity. IHC (PFA-fixed) image of SOX6 (ab30455) on sections of P18 mouse dentate gyrus. The mice were perfusion fixed with 4% PFA and then post-fixed in 4% PFA for a few hours. The blocks were prepared in agarose/sucrose and cut using a vibratome (50 µm). 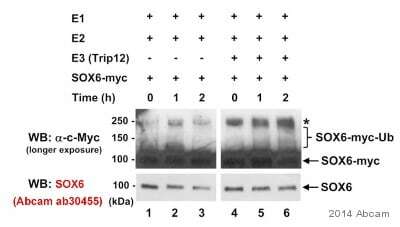 The sections were permeabilized with 1% Triton X-100 for 30 mins and blocked with 10% FBS for 2 hours at room temperature, then incubated overnight at 4°C with the primary antibody. 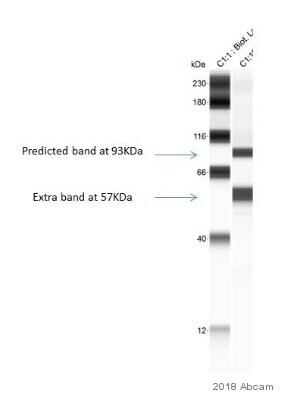 The primary antibody was used at a 1/100 dilution and detected with donkey anti-rabbit 488 secondary at 1/1000 dilution. 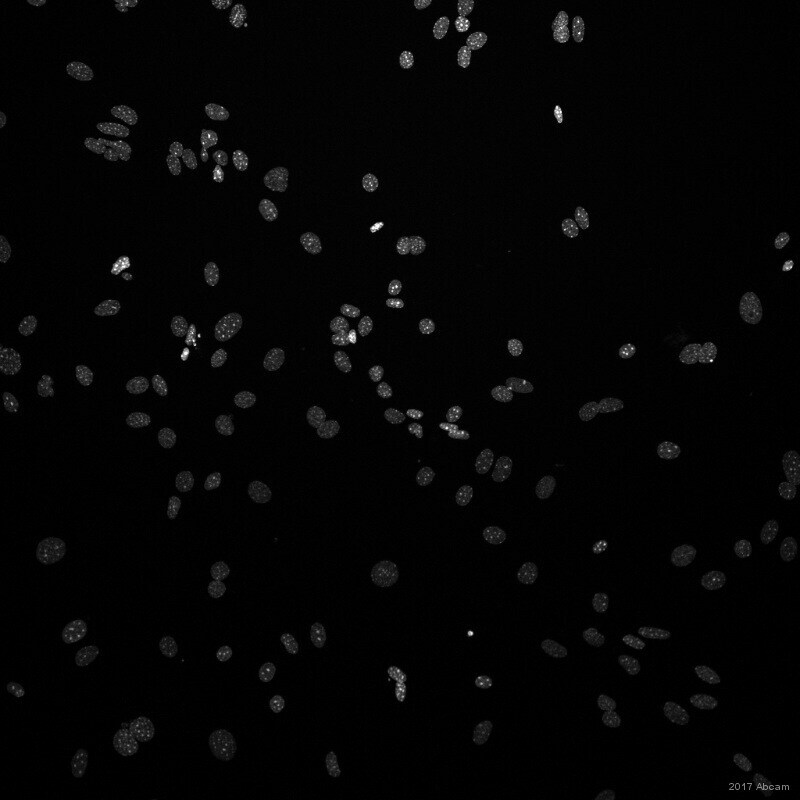 ab30455 staining Sox6 in post-natal mouse brain sections. PFA-fixed post-natal mouse brain sections were incubated for 30 minutes in blocking solution followed by an overnight incubation with ab30455 (1/500) at 4°C. 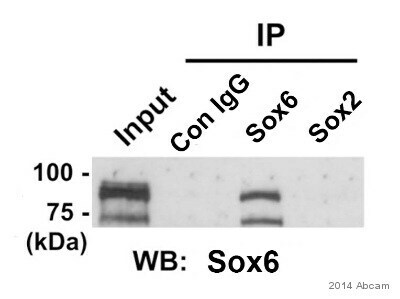 No staining was observed in sections obtained from Sox6 knockout mice. IHC-FoFr image of Sox6 staining in Rat hippocampus sections using ab30455.The sections used came from animals perfused fixed with Paraformaldehyde 4%, in phosphate buffer 0.2M. Following postfixation in the same fixative overnight, the brains were cryoprotected in sucrose 30% overnight. immunostainings were performed using the ‘free floating’ technique. Publishing research using ab30455? Please let us know so that we can cite the reference in this datasheet.